Organizations of all sizes in the business of developing, publishing and selling e-learning titles. Our customers include both commercial training companies and certifying organizations. With 1 year contract. No setup fee. Firmwater LMS is the Platform for Training Providers. Easily sell & deliver training to your customers. Manage all your clients through a single interface. In just minutes, set up a client with their own LMS and grant access to all or part of your content library. Each client has its own branding, settings, users, and content library. A clean and simple user interface makes the LMS easy to use, reducing your support costs. Make Firmwater your LMS and start growing your e-learning business today. Firmwater LMS Reviews Recently Reviewed! Pros: It has a lot of great features: Allowing a payee to send an invitation to someone else, easy access to the certificates after account is inactive, ability to send e-mails to participants reminding them of their time limit, automatically deactivating participants after a period of time, easy access to management to change participant's information (e-mail address), being able to resend invitations to start the class, easy access to view participant's information by management, and many other features that I can't think of. Cons: There are only a few drawbacks or cons that we found: Some reports cannot be printed out using PDF. Overall: The most important benefit, besides very few if any user technical issues, is not having to personally deactivate accounts because the system does it automatically. Hi Patty, thank you for a great, comprehensive review! We are very glad that our LMS features meet your needs and most importantly, that you find our LMS easy to navigate. All of our reports, with the exception of 'Attempt Data Export', are available for PDF export. We encourage you to get in touch with our support team for more information about exporting reports. Pros: Firmwater's LMS is very easy to setup and use. It is easy for us, as a training company, to add new clients, get them setup with an administrative account, show them the basics, and then let them do what they need to do. I like the customization options that we can provide to each new client (custom domain, company logo, etc.) with just a few clicks of the mouse. Cons: One feature that I wish was available within Firmwater was the ability to email users or send users reminders that their training needs to be completed by this date. As it stands currently, we have to generate reports and then export those reports to get a list of email addresses that have not completed a program. Overall: Overall, I would strongly recommend Firmwater to any small - medium sized business looking for a simple and effective LMS. This LMS is fantastic for training companies such as our own that resell training programs to other businesses. Firmwater provides a great service to our company. Dax: Thanks for your review. Our #1 customer enhancement request is for automated email notifications. The initial functionality is now available and added functionality will be available later in the year. Pros: The white-labeled training portal is a market differentiator for selling to our B2B clients. Cons: Some of the standard features, such as free trial access and monthly subscriptions, are not available with Firmwater LMS. The feature of customizing training certificates is limited which can cause issues with regulatory requirements. Navigating and using the platform is not always user friendly and user mistakes can cause costly errors if you aren't careful. I don't care for having to rely on Firmwater staff to help me implement changes in my portal. Overall: Firmwater LMS allows us to offer our clients the unique ability have their very own, branded training portal. The ability to completely control the management of users, training content, reporting, training records, etc. are all very valuable features which has allowed us to win more contracts. Also, when things do go wrong, Firmwater LMS absolutely delivers on customer support. Thank you so much for your kind words. We really strive for Firmwater LMS to help training businesses like yours to differentiate themselves in the industry. Pros: Works with what I need with an excellent reporting ability. Cons: Not a con exactly, just that it offers so much that I haven't had a chance to learn it all. Overall: Beginning as a novice, I must have tried the patience to the limit of the customer support people. I cannot express how fantastic and supportive they have been. The most striking thing about working with Firmwater, is the time they have taken to walk me through the steps needed to satisfy my customers' needs. If it didn't at first work, they worked to make it work to my needs. I didn't have to fit into a cookie cutter program, instead it was adjusted to fit what I needed. Would I encourage others to work with Firmwater?- in a heartbeat I would and have. Recommendations to other buyers: Just that anyone looking for an affordable Learning Management System, should give it a trial run before any decision to purchase an alternative program is made. Overall: My biggest surprise was the across the board competence of Firmwater's support team. I am not technically sophisticated, and a small company. They are not afraid to make better suggestions, and do what they say they will do. Their pricing is more than fair. The biggest benefit at this point in my growth, is I know that I can trust Firmwater to solve whatever problems come along and always have my best interest at the center of their support. My company offers online new home sales education to Realtors. Its all good. As it should be. If you are starting an e-commerce business, I highly recommend Firmwater. Pros: The software is user friendly for a non-skilled individual like myself to not only deliver educational content, but also on the backend for controlling content, managing users, and providing reports. Cons: Not a durn thing so far :), super easy and I am learning new things all the time. Overall: My company has been with Firmwater since late 2015, and we could not be happier. Their customer service beats any company I've worked with in the past by leaps and bounds. They genuinly want your business to be successful, and go the extra mile to help us out and learn the software. Well worth the money, and unless prices go up some time in the future I think our relationship will last for a long time. Pros: It's stability. Especially for an LMS, Bugs can really hinder positive customer experience. Not with Firmwater - the software is well implemented. With over 25,000 trainings we use their LMS extensively. No major issues/ bugs occurred. Overall: Overall, I want to thank Firmwater for their great engagement in supporting our business. If you are looking for an experienced and yet flexible business partner, you don't have to look further! Comments: We've been using Firmwater as our LMS provider since 2010, and it feels like they've grown right along with us. They've always been very responsive to our needs, and provide excellent and speedy tech support. As a very small company, we didn't have the resources or expertise in-house to develop or manage our own LMS, and we didn't have the big dollars needed to develop one. We are content producers, not computer programmers! Firmwater's SAAS model gave us a way to monetize our content in a way that was affordable and doable for us. Over the past five years, they have continued to develop and improve their product. The relatively new integration with Shopify was fabulous, it made things so much easier. Shopify allows us to use discount codes, which is an important marketing tool for us. And we now use our Shopify webstore as our website, saving us some money and making it easier for us to update our own content. Pros: We can offer custom portals to our corporate clients. Students can print their Certificate of Completion from their Training Plan. Cons: The per-head registration fee is the same, regardless of the size of the price of the course, but I think this is more our problem than theirs! Comments: I have been involved in LMS procurement for 15 years for organizations in the public, private and inter-governmental sectors. In my role as COO of Blue House Energy I have been using Firmwater for three years. We chose Firmwater after a detailed review of options, For a training company/organization, Firmwater is the best I have reviewed or used. Comments: I have been using the Firmwater LMS for over a year now and I have to say it is one of the best learning management systems I have used to date. It is easy to configure and they provide many options within the system both for small organizations as well as large organizations that have multiple locations and many users. The system is very fast and stable. I also use SCORM Cloud and the performance difference is not noticeable between the two platforms. The best feature of the Firmwater LMS and my primary reason for using it is the ability to create branded instances of the LMS that are client-specific portals. The client portals are considered 'slave' instances to your 'master' LMS installation. The LMS allows you to grant access to content from a 'master' to a 'slave'. This means that I can have groups of users completely isolated from each other and only upload my content to the system once. When I make updates to my content, I only need to update it in a single place and then every one of my clients gets immediate access to the updated content without me having to update each client instance individually. I also have to mention that their customer support is excellent. Any issues or questions I have about the system are responded to immediately and professionally. They have gone out of their way on countless occasions to help me provide solutions to my customers. I have been trying to come up with something negative to say and (not) unfortunately I really can't say anything bad about my experience with the Firmwater LMS. Since I started using the system it has excelled at doing everything that I wanted it to. Pros: Very user friendly. Very easy to navigate. The "help" documentation is very easy to follow. Overall: We are a very small E-Learning company for Healthcare Professionals. We started our search for an LMS company knowing nothing about what we wanted, or who we wanted to work with. We actually took several months to make a decision. Diane Miziolek, Director of Business Development, has to be the most patient person I have ever met. She never pressured me and was available to answer my numerous questions whilst trying to make my decision. Once we decided on Firmwater, we've never looked back. I'm quite sure Firmwater has much larger clients from whom they receive much larger revenue, however, we have had immediate response to any questions we may have had during our transition to a new website. This included uploading our content ourselves to Firmwater (I told you we were small!) and having absolutely no idea what we were doing. Firmwater Support has always been there to hold my hand and has graciously answered my questions and pointed out errors that may have caused potential problems in the future. Comments: We've used Firmwater LMS to deliver our security awareness training to customers that do not have their own LMS. The LMS enables us to whitelabel and brand the LMS for our needs and for our customers. Support has been exceptional responding to questions related to the platform quickly and thoroughly. I would love to see a refresh on the UI and reporting. Thanks for your review! We¿re happy to provide you with what you and your customers need and are glad to hear you¿re satisfied with support. Our team is currently working on some new improvements to both UI and reporting. We always love to hear from our customers what their needs are and what they were looking to change. We will reach out to you soon to address what updates you were looking for in terms of UI and reporting. Regarding adhoc curriculum development, we recognize that this is an area of the product that we need to improve. Today, you can rearrange items in existing activities and add static content (ie. PDF) to an existing activity through the user interface. However, the user interface does not permit you to add SCO's to an existing activity at present. We do have the ability to craft multi-SCO activities using extensions to the SCORM imsmanifest.xml file. This functionality requires an understanding of SCORM's XML which is fine for the more technical user who makes regular use of that functionality. For users who are not as technically oriented or have an infrequent need, we provide them with this capability via our support team. Pros: The Firmwater LMS solution was the best choice for us because they focus on providing functionality to a business like ours. We are a global training provider and want our clients to perceive the LMS as belonging to Channel Enablers. We also wanted to establish seperate secure LMS sites for each of our major 'downstream' customers. Only Firmwater could do this for us. The payment gateway solution also suits our needs. 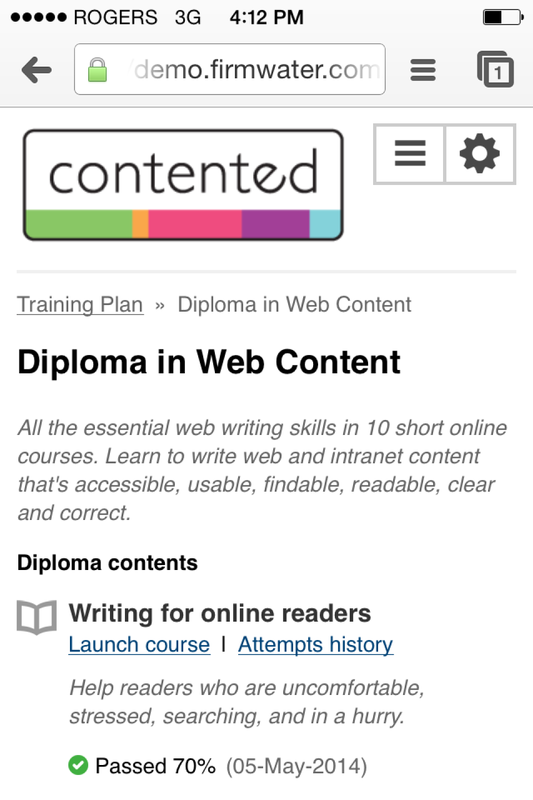 Although we had expertise in e-learning we were new to SCORM and new to LMS. Firmwater helped us deploy our courses and shielded us from a lot of the complexity. Pricing flexibility was important - Firmwater offer us options on a pay-per start or pay per number of users basis that suits our business. Overall - a good solution at a reasonable cost. Cons: The system is still developing - we look forward to additional ease of use improvements and improved user access security funcationality over time. None of these has been a show stopper. Overall: An expert company that is willing to listen and adapt to meet client needs. Happy to be a reference for them. Pros: TPC maintains the largest industrial skills training library with over 640 hours on online content and many more hours of offline training material. We currently have over 200 online clients and are adding 3 to 5 new clients per month to our TPC Online (Firmwater LMS). The Firmwater LMS makes administering so many clients and managing content between them easy. The LMS was designed from the ground up to support content publishers and handles complex tasks with ease. From our clients perspective, the Firmwater LMS hides all complexity behind a straightforward interface making it simple to register users, create training assignments, manage users, and run reports. Cons: It's difficult to think of any Cons regarding the Firmwater LMS. Overall: I highly recommend the Firmwater development team and the Firmwater LMS to any content developer/training provider that needs a solution to deliver online training content. 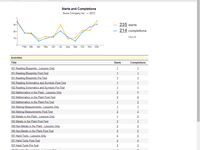 The LMS was designed with content vendors in mind. 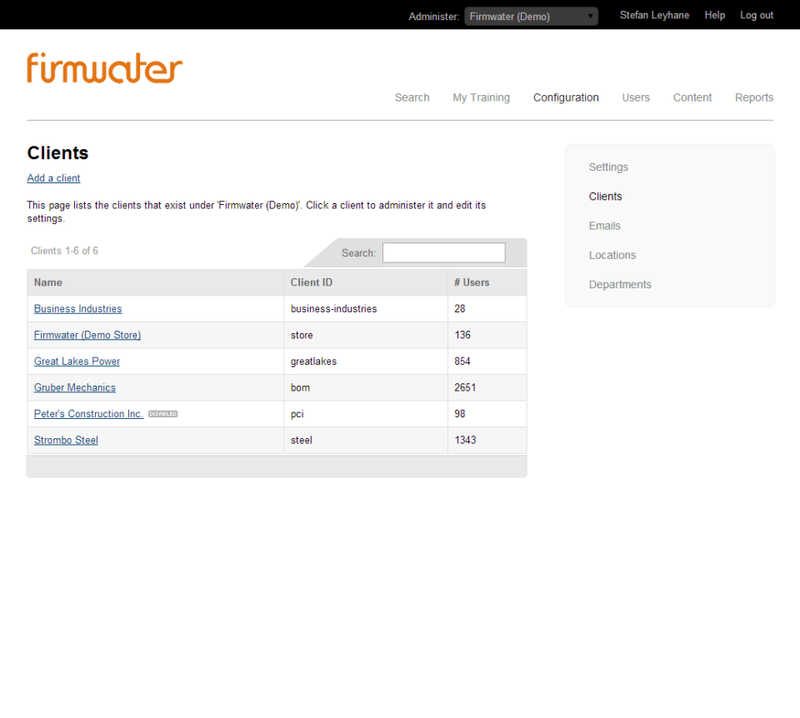 With the Firmwater LMS you can concentrate on your training content and let Firmwater handle the rest. Comments: I'm the Treasurer and Past President of the Canadian Association of Nordic Ski Instructors (CANSI) and also manage their National Office and computer systems on a volunteer basis. I managed CANSI's implementation of LMS a few years ago and continue to liaise with Firmwater for support and enhancements. Firmwater also developed our website (www.cansi.ca/en/). Firmwater accurately understand our needs / requirements, customized LMS to track members, certifications and courses and exceeded our expectations. Their support is prompt and meets our needs. When we need enhancements, they meet our needs again. Pros: Strong product and support. Great people to work with. Cons: None! Firmwater continues to exceed our expectations. 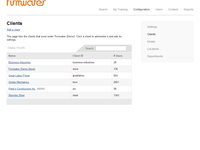 Pros: Firmwater is intuitive and easy to manage. What I've been most impressed with is their customer support. Over the past few weeks, I've reached out to our support personal several times. Not only has she helped me work through things with above and beyond Firmwater - helping me troubleshoot files and find answers. Cons: I don't have a ton of experience working with the software yet. Everything I have worked wiht has been very easy to understand. thank you for this fantastic review. We do pride ourselves on our Customer Support and are very glad to have Kinda Nehlawi as part of our Customer Success Team. We are looking forward to working with you as you get to know the LMS. 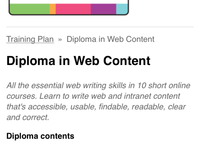 Pros: Although a instructor and author for many years, this was my first time use of online education format. Firmwater provided really outstanding customer support. They take a personal interest in your success and provide support above and beyond. The very reasonable per-course-start pricing structure allows one to market courses directly to consumers rather than agencies. Easily access and complete set of reports. Intuitive user interface for students- I received no service requests on how to access courses. Cons: Uploading multiple SCORM files into a single course requiresd customer support. Although CS is prompt in responding to this need, this still caused some delays. There is a need to post an optional threaded discussion associated with each course offering. Overall: Highly recommended for providing self-study type courses directly to individual consumers. Comments: I have been involved in LMS procurement for a number of years, including work with the United Nations Development Programme, private sector companies and governments - in short, I have reviewed many LMSs and talked with many vendors. And yes, the best support I have received since working with computers in 1982. Pros: The Firmwater LMS is ideal for companies looking for a way to monetize their content. The SAAS model combined with the technical support provide a viable way for companies with little IT infrastructure or staffing of their own to enter the eLearning market. Firmwater staff have always been quick to address technical support issues, and they continue to develop or enhance the product over time. While our courses are marketed directly to individuals, the ability to create different client portals has allowed us to develop strategic alliances with corporate users using different pricing models for each. Cons: The one feature that we could use that isn't currently available is a promo code that can be applied at checkout. Overall: They are a great team to work with, very responsive to their customers needs. Bit of a Learning Curve, but Excellent Software. Pros: This is very easy to navigate, but it does have a bit of a learning curve when getting started like anything else. Our company found it pretty easy to adapt to, and constantly use it today. Cons: The hardest part of acquisition and utilizing any new piece of software is the learning curve. The other piece to that is the resources teaching and explaining to the rest of the company how to use it. Over all, these "negatives" really are just part of any new journey. Great work. Comments: We are using Firmwater to deliver a SCORM-compliant online eLearning course that integrates video, audio, graphic animations, and testing to individuals and firms internationally through Firmwater's ecommerce portal with Shopify. In other words, there are lots of moving parts in a diverse environment. Firmwater's pros are their robust capabilities, including ecommerce front-end as well as dedicated client portals, extensive reporting, administrator process, and polished product. The cons include limited documentation and some elements that cannot be managed by the administrator. That said, Firmwater's most significant pro is the highly personalized and accessible customer service that promptly and diligently addresses questions and special needs. No product or service is without some cons; superior products are the ones that effectively address them. For that and overall, Firmwater gets a high water mark! Comments: The Firmwater LMS has exceeded our expectations for technical capabilities, ease of use and support from their team. Every single support need we have had (all relating to our learning curve) has been addressed very quickly and comprehensively. This team has made our transition to an e-learning platform seamless. Can't say enough good things about Firmwater and their LMS. Pros: Simple to set up. Simple to navigate. Best-in-class support! Comments: We took our time deciding on a LMS to support an online training program we had developed for the offshore industry. Firmwater impressed us pre-sale with their help making sure their product was a good fit for our program via product demonstration, multiple phone calls, and access to a demo version. The LMS has a very clean design, is easy to use, and for newbies (like us) had really excellent customer service when we did have any questions. We really like the client portal feature, and the Shopify integration was a huge bonus. We are very happy with our decision to go with Firmwater and highly recommend their product. Comments: I am a sales associate with Peterson's Publishing. We just recently placed one of our sales programs online. Soon after doing so, some of our customers started to request online Demos of the program before making purchases. One was quickly created by Firmwater and we were immediately walked through the process. We were also privy to reviewing what our customers experience with the online demo would be like so we could attain both sides of the process (which was very helpful). I worked with Branagh O' Shaughnessy when I had any questions on how to navigate through the system. She was very knowledgeable and available to help at anytime. This has been a great experience so far and definitely not as intimidating as I initially thought. A very user friendly program. A great software with awesome support included. Customer service as it should be. Comments: We are offering education for pre-hospital healthcare professionals and choose Firmwater as our partner. Instead of developing our own software, we decided to cooperate with them. It was one of the best & most important choices so far. Despite the good and reliable software, Firmwater does offer an outstanding customer service. We had many requests and demands and yet, all of them have been fulfilled to our statisfaction. We are happy to know that they support our business. Comments: Software has worked great since day one. When something is not right (every time it has been me not following the right process) support walks me through how to do it correctly. Great value for the money. Cons: None to date. Every thing we asked for and more. Comments: It has been an absolute pleasure working with Firmwater this past year. Our company specialises in providing medical teaching, and we had already been using a Shopify website when we started work on our e-learning projects. To find a company that integrates a top-rate LMS with our existing website was a dream come true for us. The Firmwater team are professional, friendly, and experienced; nothing is too much trouble for them. They were there every step of the way and effortlessly guided us through the launch of our new e-learning initiatives. I have no doubt that their continued expertise will see us through in many years to come as we grow the elearning side of our business. Thank you Firmwater! Pros: The Firmwater LMS is easy and simple for our students to navigate. It delivers full motion video without a hitch and has proved extremely reliable. It is also easy for our staff to navigate with fast search functions and easy setup of new students and new courses. The pricing structure allowed us to get started easily and maintain competitiveness in our market. Overall: The Firmwater team is dedicated to providing an excellent experience for our students and for the administrators. The customer service is fast, reliable and personal and they have been willing to meet our special needs as they have arisen quickly. Comments: Firmwater built a website for CANSI and enhanced their LMS application to support our requirements including data on instructors, courses, membership / course payments, interface to PayPal and updates to certifications based on taking courses. They did an excellent job of understanding our requirements and building everything to meet those requirements. Ongoing support is both responsive and excellent. Thank you so much for taking the time to review us! Our team is always delighted to work with CANSI and are happy to hear that you think of us positively. You have truly been a great partner of Firmwater. Comments: This was my first experience using an online LMS. The customer support was excellent and the staff went the extra mile to explain the system to a novice such as myself. Our client was happy with the product. All in all, a success story. Pros: Customer Support, ease of use. Cons: The online help section was not as specific to user level as it could have been, but the customer support made up for this con. Comments: We sell time management e-learning to about 100 different global 1000 companies. It is critical to show them the training in a clean, user-friendly environment before they buy. The Firmwater LMS makes it easy to create a branded, special locale for clients to play with our software. Our salespeople found it easy to demo the content on Firmwater LMS to clients via web meetings. 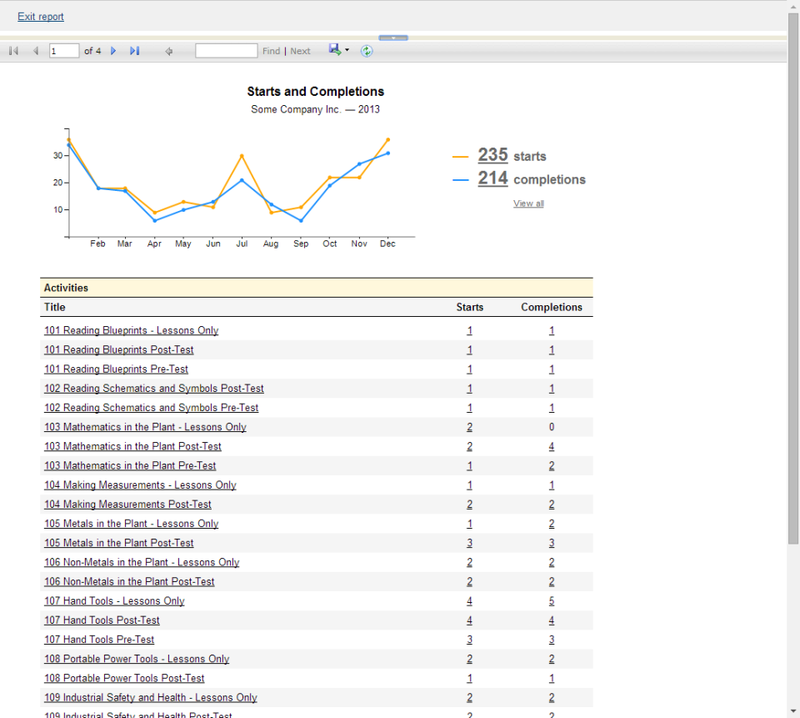 So the bottom line is that this LMS is increasing our sales every day. We recently connected Firmwater to Shopify - again pretty easy to do -- and have begun receiving orders where the buyer goes straight into our LMS from the shopping cart. Nice! My experience with Firmwater has been way beyond expectations. They offer real help in real time. Comments: Firmwater LMS is on your side. Working with them gives you the feeling that they work for you, that you have your tech support team in place and that they are serving no other clients but you. Before I made my decision to use Firmwater, i talked with consultants, and actually implemented three trial offers to compare the differences, before I made a final decision. In my heart of hearts, I believe the reason I chose Firmwater, and know it was the right decision, is how they keep everthing including their procedure manual, simple, Nothing overwhelming for an older writer who can be easily overwhelmed. Pros: The features completely delivered everything we needed. With little previous experience using a LMS, we found the system very easy to learn and navigate. This was important because we also had to support our clients as they were set-up to also administer their own systems. Improved tracking of learner's activities was something our clients were asking for. The Firmwater LMS solution met those needs and more. Overall: Most important to us is the customer service. Firmwater has supported us 100%! Thank you. Comments: The only con of the experience, is that our company was a little inexperienced with the learning software and perhaps our level was not anticipated when the initial process was begun. There were many pros, but these aspects stood out for us. The software is really clear cut and user friendly. The organization is great. The staff were excellent in getting back to our company in a timely manner. They were also professional, courteous, patient, and showed an excellent ability to problem solve. Lastly, the company was able to work with our company in a flexible manner. This meant much to us. Comments: Firmwater customized their LMS application to support the needs of CANSI including membership, certification and courses. They also developed a new website that is both member-facing and public-facing. They took the time to understand our needs and requirements and fully met them, even those needs that we didn't fully understand at the time - they went beyond what you'd typically expect. Their ongoing support is both proactive and reactive. They respond quickly to issues and the requirements for new features. Cons: The first organization set up takes a bit of getting used to but once you have an understanding of the flow it is great. Overall: I've had the opportunity to work with Firmwater as an LMS provider and have found the team to be quite helpful; the system provides great reporting with great additional features. I would not hesitate to recommend them! Comments: We sell e-learning courses to the healthcare sector and were looking for an LMS with a clean and simple user interface and smooth integration to e-commerce. We have been using Firmwater for two years now with good results. The user experience for learners is excellent. On the course setup side there were some features we couldn't find but Firmwater has been able to provide custom service for our site to suit our clients' needs. The customer service is excellent which makes all the difference. Comments: We have not yet launched our training programs due to our own internal development but the process of evaluating and setting up the Firmwater LMS was great. We were new to purchasing an LMS system so we needed extra information and attention. The people there were very helpful and went the extra mile to answer questions and integrate our platform into the LMS. They were very dependable, did what they said they would do and stayed on deadline. I look forward to working with them for a long time. Comments: I sell a digital product for real estate agents. My course is approved by the Florida Real Estate Commission for three hours of continuing education. I need a company I that will be totally honest with me, that I can absolutely depend on to serve my customer's needs. I know first hand, because they have served mine at that level. Pros: Priced right. Exceed expectations every single time. Absolutely dependable. Cons: None and don't expect any. Comments: Firmwater LMS met all of our criteria and then exceeded our expectations. From pre-sale where we were given one-on-one introduction to the product, with time to explore the demo account, and helpful, friendly advice as to whether or not it was a good fit to post-sale where we have received excellent, timely customer service and support, we couldn't be happier with this product and team behind it. Highly recommended. Comments: For our first foray into the eLearning market, Firmwater was definitely the right choice of LMS. They've provided reliable and incredibly fast customer service for a very manual method of delivering content to our customers. Overall there have been very few LMS mishaps, and the Firmwater team has also gone above and beyond to provide technical support where possible, even for our Articulate design software and Shopify integration. Comments: After investigating several LMS vendors, Soul Tree found Firmwater to be solidly ahead of the pack. Their simple to learn, but elegant platform was a key factor in our selection. We found the other platforms more difficult to ramp up on. Our favorite features are the built in e-mail alerting, comprehensive reports, and the simplicity of loading new content. In addition, the staff is very responsive and works hard to keep us satisfied. Comments: I really appreciate the simplicity of this software. It's great if there are different classrooms or courses with lots of different sections. The customer service contacted me about twice a week while I was doing a test run. The only thing I disliked was the spread of the administrator menu. It would be better suited if there were several buttons all in one tab. But this is personal preference. Pros: Great system that lets me easily do all the task necessary to run a learning center for my clients. I love that is is straight forward and easy to set up users, add a variety of materials and assign those resources. Staff has been able to set up new programs with little training. Overall: This is an excellent product for anyone wanting to have a LMS for their organization. Comments: First time LMS user and it has been easy to pick up. Customer support has been quick to respond and very helpful. Each update had made using their LMS easier. Pros: Once I figured out what I needed to get done in it, it is relatively easy to use. Cons: user interface appears outdated and reporting feature is lacking. Overall: The firmwater software does gets us by. The reporting feature is not ideal and I often question the accuracy of its data, and I feel as if I have no specified customer support manager. We¿re sorry to hear that Patrick. Our team is known for excellent customer support and are quite surprised to see that you feel this way as we have always received excellent compliments for our service from your end. We have been trying to reach out to you and further explore the features you needed. Please give us a call or email us at your convenience to discuss this in more depth. Comments: Firmwater is a great LMS. It has a straightforward interface, and a beginning user could be up and running in short order. I have reviewed every LMS on this list, and though Firmwater lacked some features that very few LMS's actually have (I work in a very regulated environment and have incredibly specific requirements) I found it to be functional and powerful for the pricepoint. Comments: After a year of using the system we're confident the right choice was made. Their team supported us in every step of the migration from our previous LMS and added significant value to that effort, rather than just 'playing vendor'. The implementation team far exceeded our expectations and support has not missed a beat since we went live. We are a very satisfied customer!